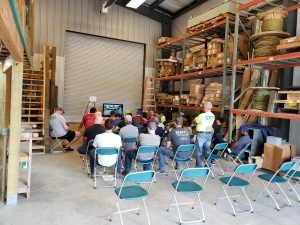 We recently held our annual company-wide safety picnic! 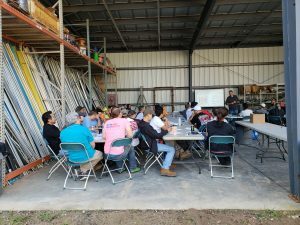 This was a time where all employees came together for a day of interesting and informative training followed by fellowship over a delicious lunch, an awards ceremony, and some fun raffles and door prizes. 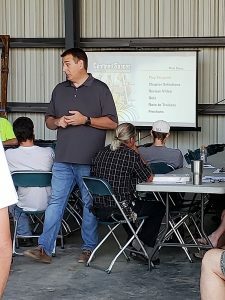 Some of this year’s training topics included: Ladder Safety, Confined Spaces Training, and Defensive Driving. This day is dedicated to the safety of our company’s most important asset: our employees! 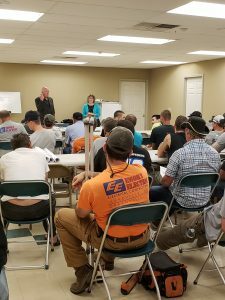 It is an exciting opportunity to implement new safety practices into our workforce. We have found it to be a productive tool in ensuring our top goal: our employees making it home at the end of each day. And of course, a very special thank you to our caterer, Jeff McLeod of Precision Palate, who served us with yet again another wonderful BBQ lunch! Lastly, we want to wish a BIG congratulations to this year’s award winners! We appreciate you and all your hard work and dedication! 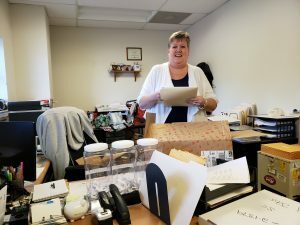 Our office manager, Amy Limbo, preparing the awards!